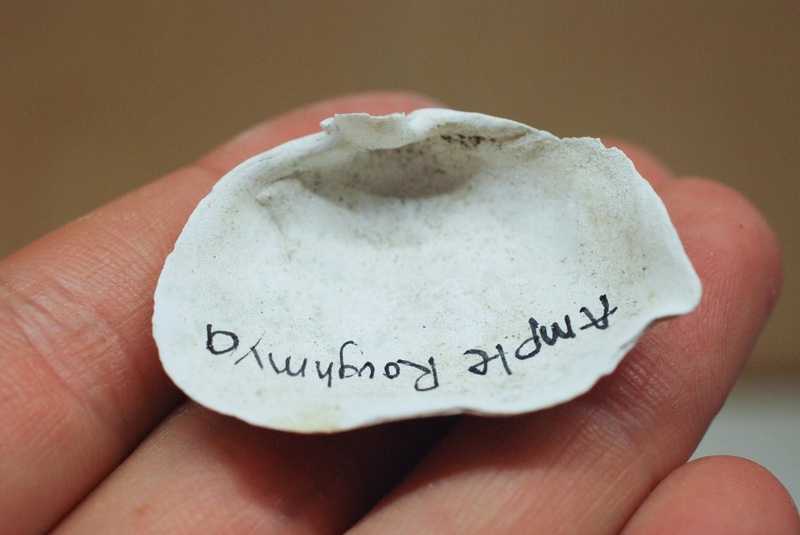 One shell valve from an ample roughmya from the Hakai Institute's shell specimen collection on Calvert Island. Note that the periostracum is absent. Photos by Kelly Fretwell. 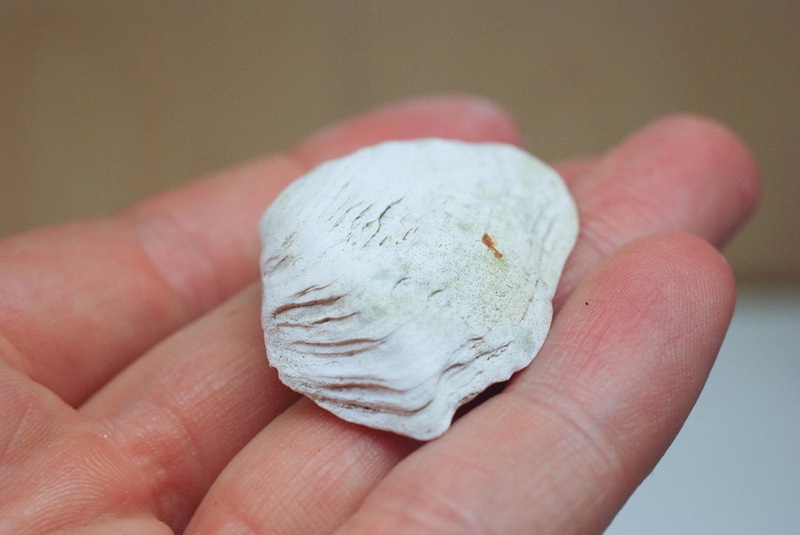 The ample roughmya's shell can be irregular and variable in shape, however it is generally described as having one rounded end (anterior) and one square end (posterior) (click here for information on shell orientation). 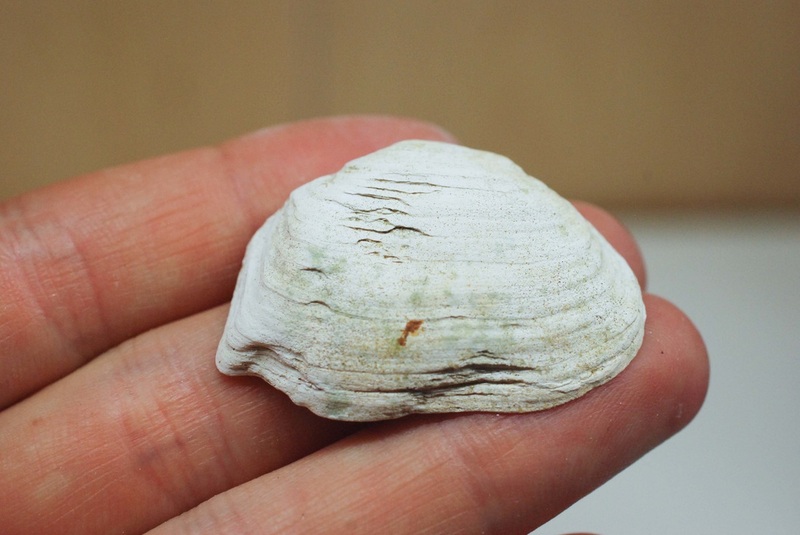 While it can be tricky to identify because of this variability, the shell has a couple of distinctive features that can help with identification: two ridges radiate from the umbo, and it has a broken pallial line (interior). Most of the shell exterior is covered in a light brown to black periostracum. Its siphons are thick, fused, and coloured reddish to rusty brown. The shell grows to a maximum length of 9 cm. This species buries to 15 cm deep or more in mud, sand, and gravel sediments, in the intertidal and subtidal to depths of 150 m. Its range extends from northern Alaska to Puget Sound, Washington. The ample roughmya's siphons may be confused for those of a Pacific geoduck (Panopea generosa). ​Harbo, R. M. (1997) Shells & Shellfish of the Pacific Northwest. Madeira Park, BC: Harbour Publishing. P. 173.